The Grace College Athletic Department is excited about the addition of graduate Andria Harshman (2002), pictured at right, as the new head volleyball coach and assistant athletic director. 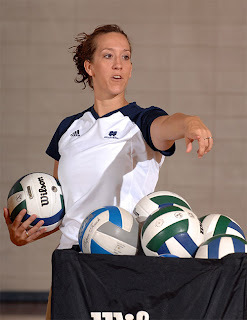 Harshman comes to Grace from the University of Notre Dame, where she was the volunteer assistant coach this past season. During her time at Grace, Andria was a member of both the volleyball and track team. Through her four years as a player, the volleyball team won three MCC tournaments and three regular season championships. In 2001-2002 season, the team was named NAIA Region VIII Champions and participated in the NAIA finals at Palm Beach Atlantic University. Harshman also excelled on the track team and broke the school record in the hammer throw. She placed fourth at NCCAA Nationals in the hammer throw while placing third in the javelin. In 2002 Andria was named Female Athlete of the Year. She has also served as head volleyball coach at Blackhawk Christian High School in Fort Wayne, Indiana, and at Lyman High School in Orlando, Florida.